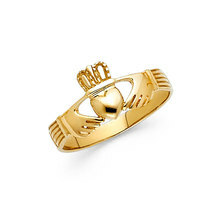 14K Yellow Gold Ladies Claddagh Ring Description This ladies claddagh ring is crafted from polished 14K yellow gold. he Claddagh ring is a traditional Irish ring given which represents love, loyalty, and friendship (the hands represent friendship, the heart represents love, and the crown represents loyalty) Ring available in sizes 4 thru 9 - whole half sizes. Item Specifications: Gold Weight: Approx. 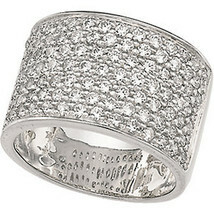 1.9 grams (depending on ring size) Width: 10mm Have a Nice Day!